While we were in Oslo freezing we joked that we might end up having better weather in Faroe and so it happend, but who wants sunshine in Faroe when the rest of the world expects to see the wind blowing and the rain pouring down. But knowing that the rest of the northern hemisphere enjoys summer temperatures right now we were kind of lucky to be able to do the hikes we so feared in warm and pleasent sunshine, a fair breeze and plenty of time to shoot the photos we dreamed of for so long. 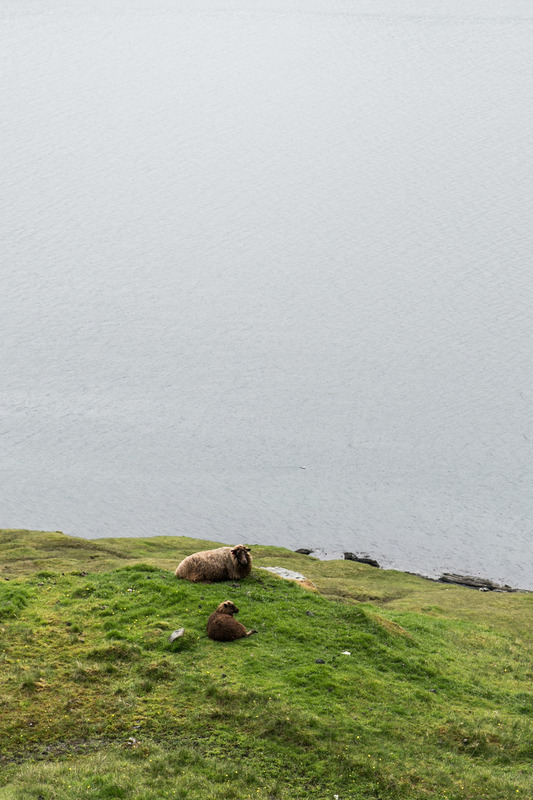 There are more sheep than people on the islands and they are quite shy. But who doesn't want to be a sheep here? No rules but food to sleep on and lay on while nibbling the finest herbs around you? Some sheep are kept on the steep slops along the shores and in order to bring them home for shearing the men bring ropes and lower them on the boats in the water. We didn't watch this act of courage but it must be true! How else would they get them home from there? This site as you can imagine can be truly windy and freezing cold but we had our sleeves rolled up and the impression we are dreaming with a scenery like this.